Suzannah Ashley: Baby Canvases II Show is up! 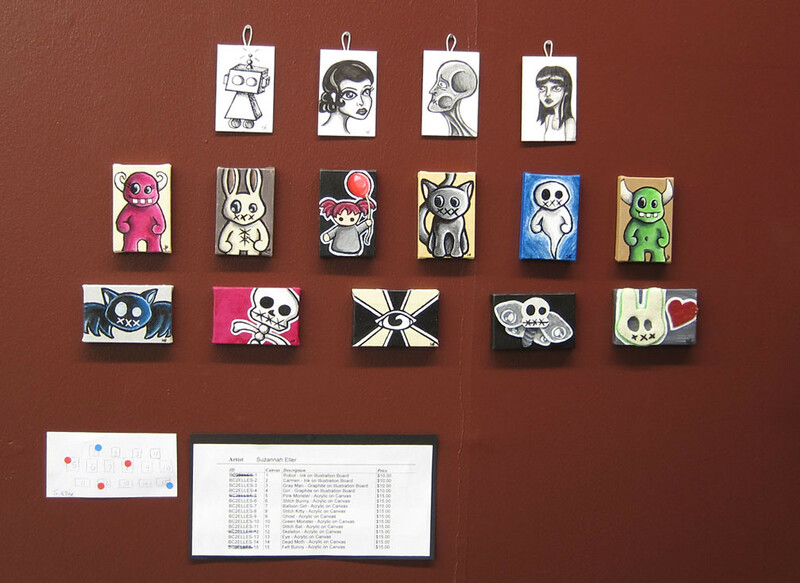 Baby Canvases II Show is up! So much of the last 2 weeks has been wrapping up work for the Baby Canvases II show at the Soundry. I finished all 15 works and added little tags to the back of them with my blog address and dropped them off last Wednesday. This past Saturday was the show opening. There were so many good works. I drank a delicious lemonade fizz served up by the lovely folks at the Soundry. HINT: The Soundry is a gallery, studio space, and coffee bar all in one! My friend Katie, who also had work in the show, dragged me over to where my stuff was displayed. I was surprised and thrilled to see that within an hour of the show opening 2 of my works had already sold. 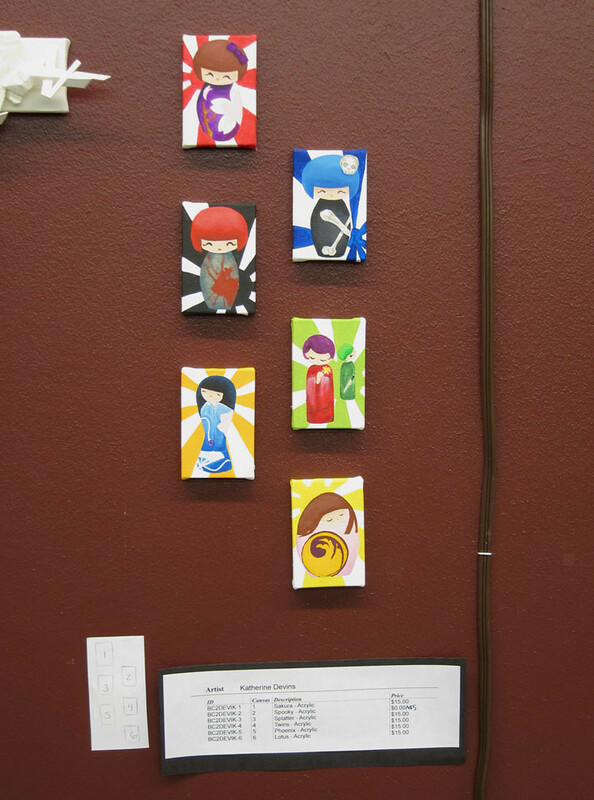 :D I took a picture of my hanging work before I left, and now a total of 5 had been sold! *twirls* I'm very excited if you can't tell. This is the first time I've sold anything I've made, which is super awesome. I'm so glad some of them (maybe more?) will have new homes. I'll be honest, I had a hard time relinquishing some of these to the show once they were finished. In particular, that little girl with the red balloon. She's modeled after some of the dolls I'll be making soon. I was finally able to put her in with the rest of the pieces once I decided I'd make myself a bigger version of her for my home. Turns out my sisters all want a version of her too, as its become their favorite as well. You can see more detailed views of all of these on my Flickr Account. 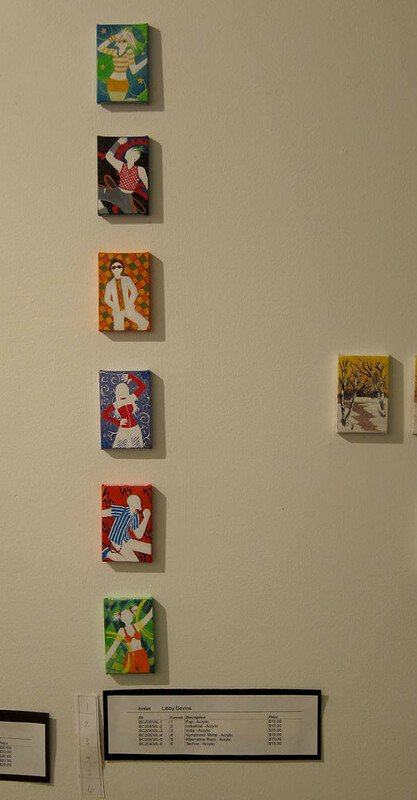 Here are the works Katie had up, and below that are the works her sister put into the show. Katie made some really cute kokeshi girls. I really loved the little blue skull one, so its mine! We're doing an art trade. Her blue skull kokeshi for a variation of my Stitch Bunny. The show is up until July 28, so if you are in the Northern Virginia area, you should go check it out. There really are some very neat works, and its just an neat space overall to visit.